Known as ZEYDOW in the crystal structure database (this species has a melting point of -138C, and its no trivial matter to measure x-ray diffraction of such a crystal! ); a ωB97XD/Def2-TZVPP calculation is used to quantify the electron density  and this is then subjected to localisation using the ELF function. The little purple spheres represent so-called monosynaptic electron basins, or lone pairs as we might rather loosely call them (pair is not always an accurate term). How these “lone pairs” act as electron donors into empty σ* acceptors can be quantified using NBO theory. The following table shows as many as 24 strong interactions (> 10 kcal/mol). This now augments my previous post on “Anomeric effects at carbon involving lone pairs originating from one or two nitrogens” and represents an example of “Anomeric effects at oxygen involving lone pairs originating from oxygen”. The final two entries originate from lone pairs on the central oxygen, donating approximately antiperiplanar (~160°) into the O-CF3 antibonds, but with only a low value of the E(2) interaction energy. These two lone pairs are curiously inert. 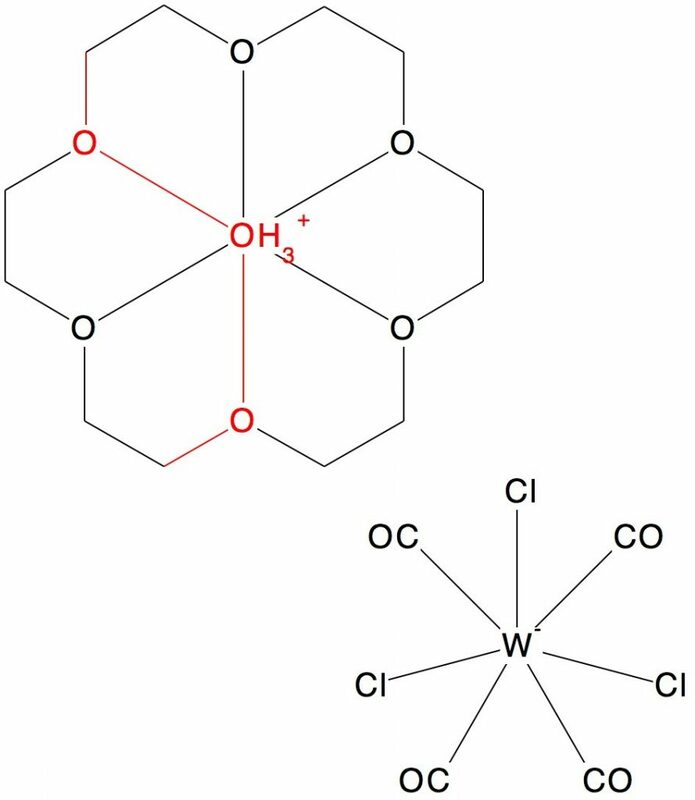 Apart from this curious molecule, there are few other examples of the R-O-O-O-R functional group, but this one did catch my eye, largely because it was retrieved from a search specification of R-O-O-O-R. The central oxygen apparently supports six O-O bonds, as well as three hydrogens. It is nothing of the sort of course. Reading the text reveals it is really three O…H-O bonds, disordered into two equally probable positions. There are no O-O bonds present at all, which reminds us we must always subject structures derived from x-ray crystallography to a chemical reality check. This entry was posted on Thursday, August 4th, 2016 at 2:25 pm and is filed under crystal_structure_mining, Interesting chemistry. You can follow any responses to this entry through the RSS 2.0 feed. You can leave a response, or trackback from your own site. Stereoelectronic effects galore: bis(trifluoromethyl)trioxide. is licensed by Henry Rzepa under a Creative Commons Attribution-Noncommercial-Share Alike 3.0 United States License.